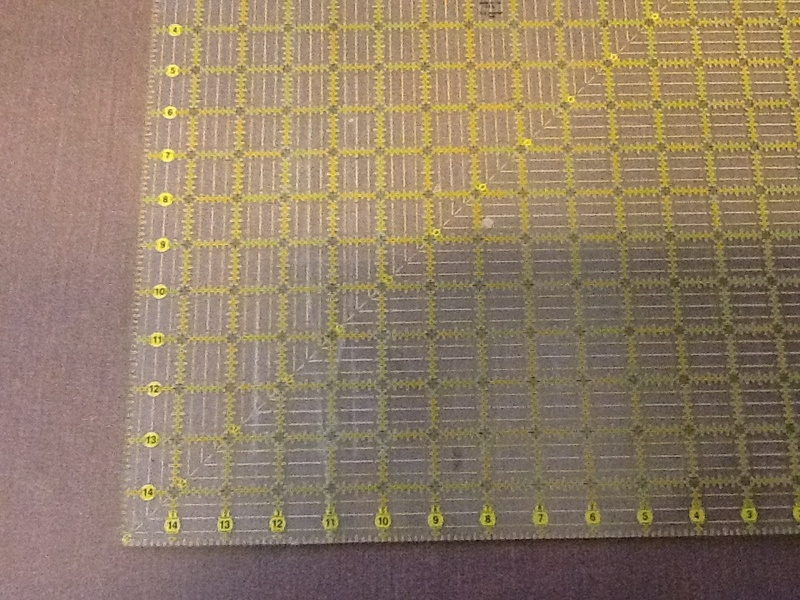 My husband stepped on my new 6-1/2" x 24-1/2" Creative Grids ruler. He put the pieces on my sewing chair with a note and promised to replace it for me. He could have just hidden the pieces, and I would have assumed I "lost" it somewhere, but he didn't. He understands that my tools are as important to me as his are to him. Question: The longer piece could be straightened out to a 12-1/2" long ruler and the smaller piece can be cut to a 6-1/2" square. Does anyone have any ideas about how to cut the plastic that this ruler is made from? I was thinking I might be able to do it with my Dremel. Definitely you can cut them to usable pieces ... now it's a double win. New full size, and the smaller ones will be handy for other reasons. If you have smaller pieces than you mentioned, cut them into usable squares/rectangles too. I can't believe how often I use my little 2-1/2" square. Perfect when I want something FC! Not sure what a dremel is? ... but yes, basically it cuts the same as glass. Dremel: a line of tools made for hobbiests and crafters. Made right here in Racine Wi. Good ideas for salvaging the pieces! Home Depot won't cut acrylic. I use my table saw. I put a layer of painters tape on each side where I want to cut and cut slowly. The painters tape helps prevent splits. Dremel or hacksaw (clamp the ruler to a block of wood so it's supported while being sawn -- so it isn't hanging out in thin air -- and then it shouldn't split). What a precious story! I think my DH would have first asked me "What was your ruler doing on the floor?" And then he would have GLUED IT BACK TOGETHER! Your DH is really a good sport! Great idea you have to make two rulers with the broken pieces. Was it a clean break across into 2 pieces? I leaned against my 15 inch square and broke it into two pieces. Someone suggested trying to glue it before discarding it. I used a clear piece of tape on the back and lined up my 2 pieces perfectly being careful the the edges where straight. I stuck down the tape straddling the crack in one long piece. I then used the tape as a hinge and bent one piece down the side of the table. I ran a bead of Superglue down the crack and quickly laid the whole ruler back on the table. I held the pieces down and tight to each other until they dried. My square is still going strong a year later. The crack is at the 11 inch mark. Last edited by Tartan; 04-22-2013 at 12:09 PM. I fixed a cracked ruler using clear packaging tape on the back and it worked just fine. I haven't tried with a broken pieces. Lowes here won't cut anything except window blinds. Check with your friendly Ace Hardware, they sell and cut plastic. My DH makes me templates out of it all the time. Works great for those paper templates you get in your quilting mags. If you or your Dh can't or don't want to do it you can check with any window repair place, they may be able to help you. Good luck. We've cut acrylic with a small circular saw. Put the blue painters tape over where you want to cut, draw a line and let her rip! Don't forget to sand the edge smooth so it doesn't have any rough edges to catch on the fabric. The dremel would work. A fine hack saw is the shot as well - something like a scroll saw or jeweler's saw would work as well. Go to a glass cutting shop. They will probably cut it for you. Our local shop has made custom plexiglass templates for some of our guild members. Thank you all for your help and advice. Unfortunately, the crack was at an angle, and though it was a clean break, would have been too unstable to glue back together, IMHO. My aha moment was to call my son, who is even craftier than I (the apple doesn't fall too far from the tree) and who has all the big tools. When I explained what happened, he said, sure, come on over. And 10 minutes after I got there, I had 2 rulers - 14" and 7-1/2". I told my DH that I wasn't going to replace it, since I had actually found the 24-1/2" length unwieldy and awkward to handle, but I had broken my June Taylor 12" Shape Cut and wanted to replace it with the 18". So he said he'd buy it for me. Like I said, he's a sweetie. A picture framing shop or one at JoAnns or Michaels might cut them for you. Ditto on Ace Hardware. If I need a template for cutting a lot of pieces, I get my local Ace Hardware to cut it out of plexiglass for me. I can't speak for Home Depot but Lowe's will only cut the plexi that they sell. The reason is that if they mess the cut up they can't replace the item it they don't sell it. The plexi in rulers is a bit different thickness and makeup. It won't break on a score cleanly that Lowe's cutters make. After you cut it you have to sand the edge to make it smooth and remove the jagged parts. I have tried it. I also work for Lowe's so I know their cutter. I have used it many times. If your husband has a jig-saw or other saw, he could cut the pieces down. I've seen demonstrations where they put masking tape on the piece, then cut, or you could go to your local hardware store or Home Depot - they should be able to help you. You might also be able to use your Dremel, it can do amazing things. I have used the ''saw blade'' out of the Aluminum foil box. I save these because they come in handy for so many things. I cut it to size-staple it onto 2 popsicle sticks and use it like a 2 man saw. The blade is thin enough to make a clean and precise cut. Just clamp your project down on a scrap piece of wood. If hubby has cutting tools, maybe he can cut down the pieces to the sizes you desire. No idea on the ruler, but your hubby sure is a gem!! So how did your son cut it?